Before you fire your unit up for the first time of the season, you’ll want to make sure you've completed any necessary maintenance and work. There’s nothing worse than waking up to a cold morning and wanting to turn the furnace on, only to realize you haven’t done any oil tank maintenance yet. Of course, it can be hard to complete any oil furnace maintenance if you don’t know when you should be working on it, or what you should be doing. Is there a set furnace service schedule to follow? Where do you learn something like this? Today, we’re here to answer all these questions for you. We’ve put together this guide to help you get your furnace and tank in order for this season. We’ll talk about concerns you should be aware of, when and how to address them and how often you’ll need to service your furnace in the first place. By the time you’re finished here, you’ll feel like a pro, and you’ll be ready to tackle any of the common concerns your furnace can throw at you. How Often Should You Have Your Furnace Cleaned and Maintained? There are several answers to the question of how often you should clean and maintain your furnace, and all of them are correct and apply to slightly different circumstances. The key to understanding these answers comes in knowing the difference between two separate but related types of maintenance. Preventative maintenance is anything you do even though nothing is wrong. This type of service work helps you ensure everything continues to run smoothly and that nothing goes wrong in the future. Think of a wood-burning fireplace, for instance. When you’re dealing with one of these, you’ll want to clean the chimney every year, even if nothing is wrong with it. This helps ensure it doesn't break down unexpectedly in the future and that the fireplace continues to operate without incident. In terms of a furnace, preventative maintenance might look like regular cleaning and replacement of various components, whether it seems like they need it or not. This type of regular tank service schedule helps ensure your furnace will continue to run smoothly for the foreseeable future, and will hopefully prevent any major incidents from occurring. This type of maintenance consists of actively solving problems that have arisen within the equipment or machine you’re trying to service — something has died or broken that you must either repair or replace altogether. The idea is that preventative maintenance prevents the need for reactive maintenance. Ideally, if a system is well-maintained, no significant breakages or disturbances will occur, and there will be no need for more heavy-duty reactive maintenance. Unfortunately, it isn’t always quite so simple. Accidents happen, and parts occasionally break for no discernable reasons. Other times, parts just get old and wear out with time, no matter how well you took care of them. 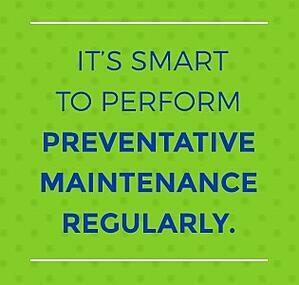 In this way, reactive maintenance is an inevitable part of servicing your furnace. How Often Should You Perform Each Type of Maintenance? You should perform reactive maintenance on an as-needed basis — there is no need to practice this regularly. Instead, you’ll only need to conduct this type of maintenance when something breaks or wears down to the point that you need to replace it. On the other hand, it's smart to perform preventative maintenance regularly. You should at least conduct these inspections on an annual basis, although you may way do it more often if you use your furnace heavily. Certainly, it’s a good idea to perform necessary preventative maintenance before the heating season kicks off in earnest. You should always clean annually at the very least — this is a crucial part of preventative maintenance. You may find it useful to do it more often, however. Consider setting up a monthly schedule during peak usage months, or as often as you feel is necessary. Take note of how often your furnace becomes dirty and adjust your schedule accordingly. This schedule will likely look different for everyone, as your usage patterns will be unique to you. Replacing parts is slightly different from cleaning and will probably not need to happen as often. Consider each of the major components of your furnace separately, as well as how often they should be replaced. How Often Should You Replace Oil Tank Filters? A good rule of thumb is that you should change your oil tank filter annually. You can change it more often than that if you begin to notice it’s functioning less efficiently or seems to be acting up in any way. Certainly, we wouldn’t recommend changing it any less than once a year. We recommend doing this at the start of the heating season when you’re running through your checklist of fall chores. By simply making this one more item on the list, it’ll be harder to forget and easier to get done. Additionally, this means your oil tank will be at its most efficient and functional just when you need it. If you change the filter at the end of the season, however, there’s a higher chance it will become dirty and clogged before you even get the chance to use it. Changing your furnace filter regularly is a crucial part of maintaining your home’s heating systems. If you don’t do this, you’re depriving yourself and your home of the additional protection these filters would otherwise provide. They’re intended to help trap dust, dirt and other tiny particles. If your filter is overly-full, however, it won’t catch these particles, and you’ll end up breathing in far more of them than is healthy. Not only this, but your furnace will also have a more difficult time running if the filter is dirty. It will be less energy-efficient, which could end up costing you more money. However, there isn’t just one single one-size-fits-all answer to tell you when to change your filter. Instead, this answer will be slightly different for everyone, and these five factors will influence it. It’s a well-known fact that pets shed frequently. Whether you have a cat, a dog or both, you’ll still have plenty more hair and other contaminants in your home than if you didn’t have any pets. And of course, the amount of pollutants only increases with every additional pet you have. All of these contaminants pass through the filter, clogging and filling it at an accelerated rate. If you only have a one- or two-inch filter combined with multiple pets, you’ll want to change this filter once a month. With multiple pets and a four-inch filter, you should change the filter every two months. A five-inch filter combined with multiple pets will likely wear out after three months. If you only have one pet, you’ll probably be able to get away with changing your filters every two, four and six months, based respectively on the size of your filter. If you have no pets whatsoever, you should plan to change your filters every three, six and twelve months, similarly based on your filter size. As we mentioned previously, trapping dust and other similar particles is the primary function of your filters. 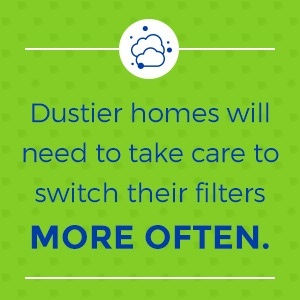 Based on this, then, it makes sense that dustier homes will need to take care to switch their filters more often. If your home is exceptionally dusty, you’ll want to be aware of this. You'll need to replace one- and two-inch filters every month, four-inch filters every other month and five-inch filters every three months. If your home is only mildly dusty, you can swap out these numbers for every two months, four months and six months, respectively. Finally, if your home is almost entirely dust-free, aim to switch your filters every three, six and twelve months, depending on your filter size. If you continuously have one of these fans running, you’ll need to change your filters more regularly. If you only run these occasionally, you’ll be able to change your filters slightly less frequently. If these fans are never on, you can wait for the longest of all. The same patterns we’ve been following for the other factors, based on filter sizes, apply here as well. For the most extreme level of fan usage, change your filters every one, two and three months. For moderate usage, try switching the filter every two, four and six months. If you never use these fans, stick to a schedule of three, six and twelve months. If anyone in your home smokes, this increases the frequency with which you’ll need to change your filters. A house with multiple smokers would be at the highest level of frequency, while a home with only one smoker would be the medium range and a home with no smokers would be the lowest range. To determine how often you’ll need to change your filters with smokers in the house, follow the same pattern we’ve been using for the previous factors, based on the size of the filter in question. If you frequently keep your windows and door open, this introduces plenty of additional environmental factors into the air that will eventually become caught in your furnace filters. Because of this, the more often you keep your windows and doors open, the more frequently you’ll need to change your filters. Determine how often you have outdoor air flowing through your home, as well as the size of your filter, to decide how often you should change it. How Often Should You Replace Your Furnace Nozzles? While the nozzles are a crucial part of your furnace, they typically don’t require replacement quite as often as other pieces of your furnace. This is simply because of how these parts function. Unlike a filter, which catches dust and then becomes clogged, a nozzle won’t reach its capacity in this way and require replacement. Still, that doesn’t mean you never need to replace your nozzles — they’ll wear out just like anything else, even if it takes a little longer. Because of this, it’s a good idea to check the condition of these nozzles when you make your annual cleaning rounds. As summer comes to a close and you start your list of fall chores, make it a point to check out your furnace, as well, paying particular attention to the nozzles. If you notice they’re beginning to look somewhat the worse for wear, don’t risk it. Replace them and enjoy the confidence and security of knowing they’ll serve you well all winter long. The most useful rule of thumb to apply to any maintenance or service involving your furnace is that an annual check-up is always a good idea. When summer begins to fade and it’s time to pull out your list of annual summer chores, add furnace maintenance to that list and tackle that along with all the rest. However, a variety of different factors will play into how often you should perform maintenance on your furnace. Some of these may apply to you while others may not, but they’re all worth keeping in mind. Here are five components to consider as you try to establish your maintenance schedule. It only makes sense that the frequency with which you use your furnace will partially dictate the frequency how often you'll need to perform maintenance services. If you use your furnace constantly all winter, you will probably need to service it more often. If, on the other hand, you only use it several times a season on the very coldest days, you can probably get away with servicing it less often. No matter how infrequently you use your furnace, however, we still recommend servicing it at least once a year at the start of the season. Fuel quality will also play a part in how often your furnace must be serviced. If you’re using extremely high-quality fuel, you’ll likely be able to go slightly longer before your furnace needs a checkup. If, on the other hand, you’re using a lesser-quality, you’ll probably want to check up on the furnace components a bit sooner. This idea, of course, ties into the concept of fuel quality. If your fuel is in any way contaminated or contains any particles that might be damaging to your furnace, you will need to service it more often. Because furnaces are not intended to handle contaminated fuel, this can cause damage to your furnace that leads it to break down faster than it would otherwise. To counteract this, you’ll need to service it more often. The fuel lines in your furnace are intended to handle just that — fuel. If, however, these lines have become contaminated with water, you’ll likely need to perform maintenance to fix this problem. Whether the water contamination is the result of flooding, a burst pipe in your house or something else altogether, this can cause significant damage to your furnace, and you'll need to address it. It should go without saying that you use your furnace differently in different seasons. Almost certainly, you use your furnace in the winter, but not in the summer. Because your furnace likely sits idle all summer, there will be no need to maintain it during these seasons. On the other hand, during the months of heavy usage, you’re much more likely to find reasons to maintain it. Keep this in mind as you plan your service schedule. When it comes to maintaining and servicing different appliances throughout the house, many people abide by the idea of only repairing a machine “when it needs it.” In other words, there are plenty of people who merely perform reactive maintenance. While reactive maintenance is an integral part of any service schedule, it entirely neglects the idea of prevention, which essentially solves these issues before they occur. By setting up a consistent and regular preventative maintenance schedule, you’ll reap a whole host of benefits that you would otherwise miss out on entirely, including these three. Sometimes, parts can wear down and operate less efficiently without you even realizing it. Even though you aren’t aware anything has gone wrong, your furnace might begin to slowly operate less efficiently, taking up more energy to perform the same task. If you merely practice reactive maintenance, this would continue until something noticeably broke. If, on the other hand, you had a regular preventative maintenance schedule, you would likely notice the problem before it truly broke — therefore, you could fix it before it causes any serious issues. This leads to better efficiency overall. A machine that operates efficiently is a machine that costs less. In our earlier example where we imagined a furnace that was beginning to become less efficient, this machine would require more energy than usual to complete an ordinary task. This higher energy usage will translate to higher expenses, which can easily cause your energy bill to shoot up before you even realize anything has gone wrong. Even though paying for a new part or a service professional might seem like an irritating expense, this is a way to save money. By servicing your furnace regularly, you protect yourself from rising energy costs due to malfunction or general wear and tear. If you’re only performing maintenance when something goes wrong, this can be difficult to remember. The odds are good that you will rarely think to check for problems, and you probably won’t notice when problems do pop up. In fact, you may not even notice until the furnace stops working altogether. If, on the other hand, you add routine furnace checkups to your basic list of yearly or seasonal chores, it becomes easier to remember. Not only this, but you’re also likely to catch problems much earlier than you would have without a schedule. This can lead to easier, less-expensive solutions that are better for everyone involved. One of the best steps you can take toward guaranteeing the safety and longevity of your furnace is to develop a consistent service schedule. Plan when you’ll perform your annual maintenance, as well as when you’ll do things like changing the filters, oil supply and more. Creating a service schedule isn’t the only way you can care for your furnace, however. You can also keep your furnace healthy by ordering high-quality oil from reliable sources. When you order from Smart Touch Energy, you don’t even have to leave the comfort of your home. Browse our products and services online and skip the hassle of shopping in person. Get started by checking out our prices near you and creating an account with us today.